← Can Forgiveness Play a Role in Criminal Justice? 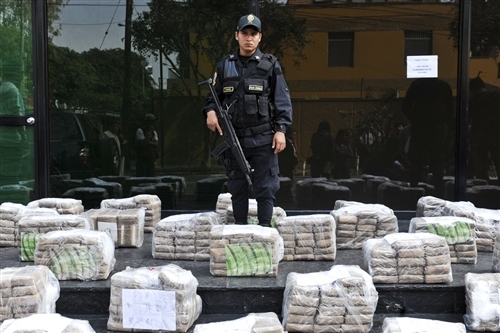 A police officer stands amid packages of cocaine seized along with other materials in anti-drug operations in Peru, during a presentation to the press in Lima on May 18, 2012. More than 1.5 tons of cocaine were confiscated. This is something I never expected to see in the Wall Street Journal: ‘….After more than four decades of a failed experiment, the human cost has become too high. It is time to consider the decriminalization of drug use and the drug market….’ Got to say, this is most certainly logical, well written and speaks to the entire corruption of the culture of North America. This entry was posted in Addictions, Corruption, Politics, Prison and Jails, The Problem. Bookmark the permalink.